Pole saws are your best ally when it comes to trimming and pruning trees on your own. In just a matter of minutes, these handy tools can make quick work of unwanted or damaged branches, all without having to call in the professionals. Just like other hand and power tools, the pole saw market is saturated with endless choices, making it a little hard to narrow things down to the best pole saws for your needs. To me, pole saws are one of the most undervalued, underrated, and misunderstood tools on the planet, so I’m especially excited to offer up our picks for the best pole saws for 2018. Below, I offer some in-depth information on what makes each one so great, and bookend it with some helpful buying advice that will guide you through the buying process. There’s just something about a good, quality manual pole saw and pruner that is easy to use, effective, and definitely not flimsy or weak. For many buyers, their needs will not go beyond a manual pole saw, and that’s perfectly fine. If you’re in the market for a manual pole saw, the Fiskars Power-Lever Pole Saw & Pruner is the best manual pole saw for the money by far. Smart design, time-tested cutting operation, and a massive level of reach all combine to create an ideal manual pole saw that is an ally for any yard. The saw looks like your typical pole saw at first glance, but the moment you use it, you get that sense of high-level craftsmanship and innovation that makes is a formidable tool that can make quick work of large and small branches, which is all you want out of a pole saw. 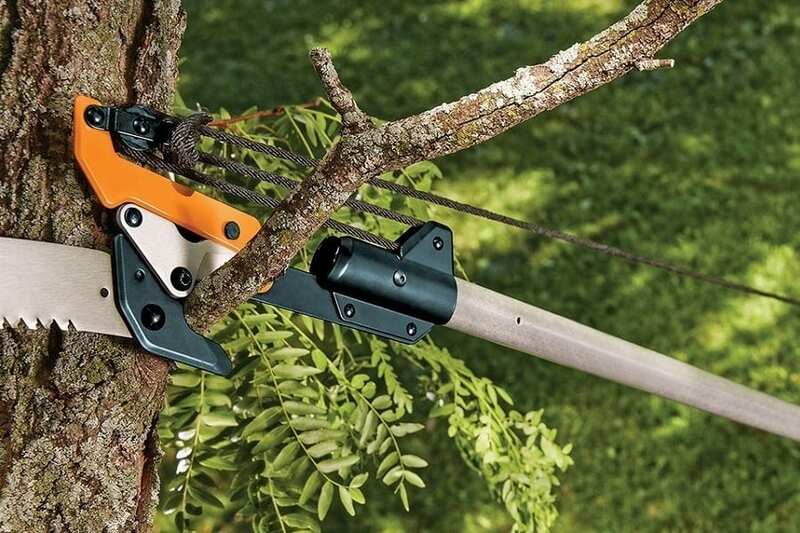 The Fiskars Power-Lever Pole Saw & Pruner’s pole is one of its most impressive features by far. The pole is made from fiberglass, making it extremely lightweight, and resistant to dents and dings. Perhaps more importantly, the pole can extend anywhere from 7 to a whopping 14 feet, which is typically double what you’d get with a gas or electric pole saw model. 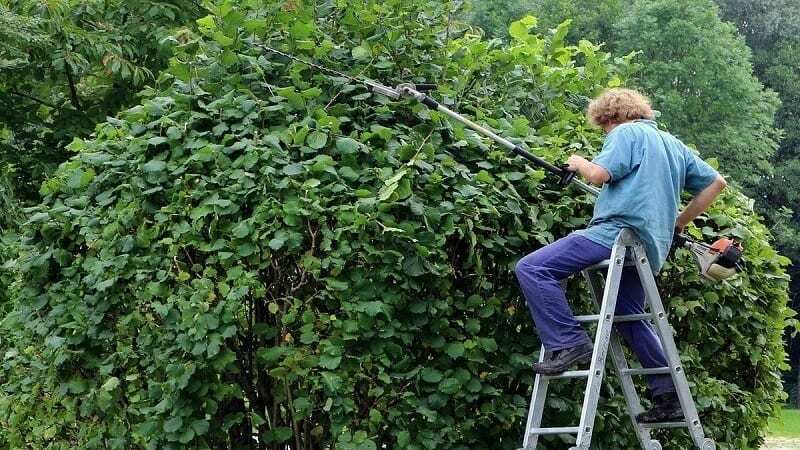 The 14 feet of reach allows you to access branches very high up, without straining or the need to climb a ladder. When in use, the saw works just as easily at smaller heights as it does taller ones. The weight distribution is very even on the Fiskars Power-Lever Pole Saw & Pruner, and with an overall weight of 5.35 pounds, you won’t have any issues holding it up for extended periods. The oval shape of the pole is fairly unique, as Fiskars opted for this shape instead of the typical circular pole. This gives the saw a little more leverage and helps to avoid any unwanted bending or swaying when using it at the max length. Now for the cutting part. Pruning clippers are attached at the end of the pole, operated by a very responsive pull cord and plastic handle. The pulley system provides ample power to the shears, making snipping branches effortless. The angling of the clippers and torque of the pull cord are a great duo. The size and shape of the shears accommodate quick snipping of branches up to 1 ⅛ inches thick, so you’ll have no problem performing fast pruning at any height under 17-20 feet. When it’s time for the big branches and more intensive cutting and trimming, the Fiskars Power-Lever Pole Saw & Pruner has you covered there as well. The product comes with a very sharp and powerful 15-inch blade with the perfect amount of curve to make quick work of larger branches. The saw blade can be quickly removed when needed with just the unscrewing of a knob. Furthermore, the pole can be extended or retracted in seconds, held in place with a double locking system that ensures the pole will never slip or move out of position during use. One of the most significant selling points of the Fiskars Power-Lever Pole Saw & Pruner is the price you’ll pay. The overall cost is well below what you’ll dish out for a non-manual pole saw, while still being just as, or even more useful depending on the scenario and tree. So, if you’re trying to go the more traditional arborist route and maintain precise cutting control at the same time, the Fiskars Power-Lever Pole Saw & Pruner is an excellent buy. The low price makes it accessible for any buyer, even those who merely want a manual pole saw option alongside their gas or electric version. You can’t go wrong either way with this one. Depending on who you talk to, a gas pole saw is generally considered the most powerful conventional pole saw, and it’s hard to disagree. Gasoline-powered engines usually offer a bit more power, and of course, come with the added benefit of cordless mobility. The best gas pole saws need to offer a lot of different aspects and features to be considered in the top tier, such as a high amount of power, a heavy-duty blade assembly, and perhaps some added versatility on the blade end as well. The Remington RM2599 Maverick Gas Pole Saw meets all these marks and more, offering buyers a very capable and robust gas pole saw that doesn’t back down from a challenge, while also providing more uses for those willing to make it happen. The saw’s build and design are very familiar to anyone that’s ever used a trimmer or edger, making it easy to pick up on and get a feel for from the start. That includes the handle assembly, and of course the trigger and handle combination as well. The RM2599’s pole length can easily be extended up to 7 feet with the twist of the lock midway down. If you’re around 5’5” tall, you can attain a maximum reach of about 12.5 feet, which is plenty tall enough to make cuts on a number of branches on the lower to mid-level of many trees. The handle setup of the RM2599 helps to offset the weight of the engine in the rear, making it easier to hold it up higher when reaching for branches. The overall weight of 13.2 pounds is not the lightest thing you’ll hold, but it’s not too bad for a gas unit. 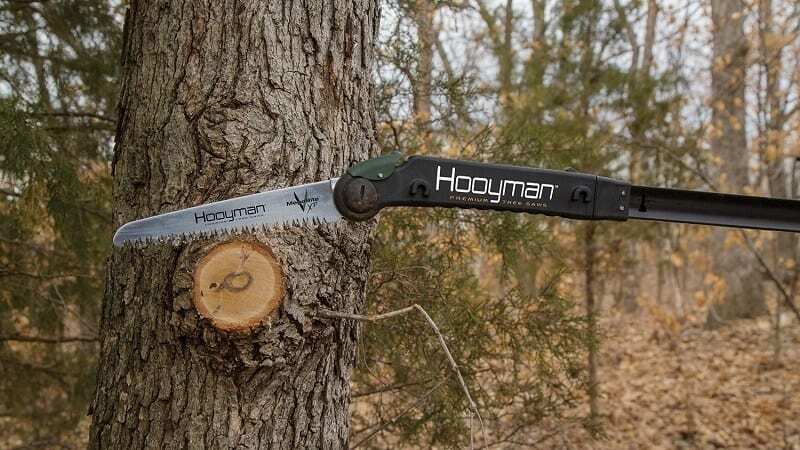 The saw bar of the RM2599 totals 8 inches in length, giving you a chainsaw blade assembly that’s plenty long enough for the average tree branch ranging up to 6.5 inches thick. With multiple cuts on each side, you can easily take on branches several more inches thicker than that without an issue as well. As for power, the RM2599 is backed by a robust 25cc 2-cycle engine that is easy to both operate and maintain. The engine has no trouble starting up with a pull of the cord or two and doesn’t run very loudly either. Saw speed is controlled by the pull of the clutch trigger under the back handle. One of the more helpful features of the saw is the auto oil mechanism for the chain. This bypasses the need to get your oil out and run a few drops over the chain now and then and hope for the best. Simply fill the reservoir with chain oil, and the RM2599 does the rest, drawing a few drops on the chain as needed. This takes the hassle out of the process, while keeping the chain and saw bar in prime condition. Another small yet helpful feature is the ability to change the position of the front handle to an ideal position for various cutting angles. Besides, the RM2599 is compatible with many different Remington attachments, letting you turn the pole saw into a blower, hedge trimmer, or edger in a matter of minutes. The Remington RM2599 is already a great gas pole saw on its own, but the ability to transform it into a number of other power tools boosts its value even more. Buyers searching for a top-tier gas pole saw should look no further than the RM2599, as its one of the best investments for your property’s landscape. Electric pole saws come in a few different varieties, so we’ve got several different picks that span the various types, along with a few different price ranges. Conventional electric pole saws offer some distinct advantages over other types of pole saws, which is great if you’re not bothered by the limitations of an extension cord. Even with a power cord following you around everywhere you go, an electric pole saw’s capabilities tend to make up for it. These saws are known for being simplistic in a good way, thanks to the lack of an engine, and the maintenance and complications that can come with it. With that said, the build and operation of a pole saw should reflect this simplicity. Sun Joe is a well-known manufacturer of quality power tools for very affordable prices, and the SWJ700E Electric Pole Saw is no exception. This pole saw is incredibly easy to use and maneuver has minimal maintenance, and a surprising amount of reach and power, all for a very fair price. The pole on the is expandable up to 8.7 feet, giving it an overall reach capacity of about 14 feet depending on the user’s size. This amount of more than sufficient, allowing you to reach a good portion of limbs on the lower and mid-level of your tree. Length adjustments are quickly made when needed, letting you adjust to different limbs. As for the SWJ700E’s cutting ability, the 8 inch Oregon blade bar gives the saw an added amount of capacity, which lets the saw handle limbs up to 7.5 inches thick without missing a beat. This should be plenty for most limbs you’ll deal with, but you can always make jump cuts if needed. The SWJ700E’s 6.5 amp power is a great complement to the blade bar size, giving the blade all the power it needs it quickly slice through a number of different limb types, without the need to force the issue by continually pressing down onto the limb while the blade is engaged. A few strategic features are included with the SWJ700E as well, such as an auto blade oiling mechanism that continually ensures the blade has the proper amount of oil. If you’ve ever used any type of chainsaw, you know how helpful this feature can be. A safety switch has been integrated into the SWJ700E, preventing accidental blade operation, and thus avoiding accidents. The safety switch must be engaged before the power button, and the trigger can be used -- something you don’t always see with electric models. The SWJ700E comes with a two-year warranty, giving you some added peace of mind when buying. Add that to the fact that this saw is already relatively cheap when considering its size, reach, and power, and you’ve got one of the better power tools buys you can find. The only real complaint of the SWJ700E is its lack of an adjustable saw bar angle, but that’s getting a little petty instead of the price and features. This is a great saw regardless. And, at just 7 pounds, you’ll have no trouble handling it and angling it yourself. Overall, the Sun Joe SWJ700E is easily our top pick for a corded electric pole saw. You get a nice amount of reach, a sturdy and durable design, and an impressive amount of power, and all without breaking the bank. It’s hard to ask for more than that. In many ways, a lot of corded electric pole saws are essentially the same in theory, as most of them pretty much do the same thing, with the only real differences being pole length, power, and an added feature or two. And while they may all achieve the ultimate goal of cutting tree branches (and a few other things,) having an added boost of power and reach can really pay off in the long run. Even a few extra amps and inches can make a big difference as to what the saw can accomplish. The WORX WG309 Electric Pole Saw offers users that much needed an extra boost, with while also adding a few very sought after convenience features, making it one of the best electric pole saws on the market, and definitely one that is perfect for those needing that added power and capacity. I’ll start with the WG309’s length. The saws assembly can extend up to 8 full feet, which is a little more than you’ll usually see with electric models in this class. The extra foot of reach gives you the ability to access another level of branches when needed. As for the saw bar assembly, the WG309’s is an impressive 10 inches long, which is certainly the longest cutting area you’ll come across without spending an absurd amount of money. The 10-inch size lets the WG309 make a quick work out of most any tree branch; even the bigger one's lesser saws might not be able to handle. The engine power is a great compliment to the saw’s other specs, coming in at eight amps. Many other electric models in this price range hang around the 6-7 amp area, so the added power amount allows for more torque and higher blade speeds, making cutting much more effortless. One of the most notable aspects of the WG309 is its 2-in-1 design. The pole can quickly be detached, and a front handle revealed on the saw body, instantly turning it into a conventional handheld chainsaw, so you get a bonus tool of sorts. With the ability to turn the WG309 into a basic chainsaw, you have the convenience of an easier way to break down larger branches after taking the branch down, rather than having to use a separate tool, hacksaw, or awkwardly hold the pole saw at close range and try to saw, something that can be very annoying. A rotating handle assembly allows for turning the saw for better angles when needed, another convenient inclusion that more saws should have. This can come in handy when you’re working with difficult branches or trying to stay clear of the fall zone. Like many pole saws in this price range, the WG309 comes with an auto oil mechanism that keeps the chain lubed at all times, not just when you remember to do it yourself, or when something seems a little off with the chain. There is a lot to love about the WG309, but if I had one complaint, it’d be the lack of an angle pivot adjustment on end. I understand that would be difficult to pull off with the design of the actual chainsaw option, but it’d still be nice to see WORX include it in future models. Overall, the WORX WG309 is one of the most powerful and capable electric pole saws you can buy, with a price point that remains under $100. Anyone looking for a versatile, more heavy-duty 2--in-1 pole saw that is up for the task whenever you have larger branches, this is the way to go. If you like the idea of electric pole saws, but don’t want to deal with a cord following you around, a battery-powered pole saw is the best route to take. You get a nearly identical amount of sawing power, and unlimited mobility -- well, as long as your battery lasts. If you already have a few power tools from a particular brand, you can usually get by with swapping out the battery pack amongst the other tools, saving you from the need to buy a bunch of batteries for each one. With this version of the BLACK+DECKER LPP120B, that’s exactly what you’re getting. This model does not come with a battery or charger, but if you’ve got other *MAX batteries lying around for your other BLACK+DECKER tools, this pole saw is an economical buy. Even if you don’t own compatible batteries and chargers, you can switch to the full package version of this saw, and still end up with an affordable cordless pole saw that outperforms many of its corded electric counterparts. A significant advantage of the LPP120B is its long reach. The pole can extend anywhere from 6.5 feet to 10 feet, which provides about 15 feet of maximum reach depending on your height. 15 feet is definitely long enough to reach most any limb on your tree that will require trimming or pruning. The saw bar is 8 inches long, placing the LPP120B right up there with many of the best electric and gas powered pole saws on the market. The design of the bar accommodates up to 6.5-inch thick tree branches with one cut, so don’t worry about only being able to cut smaller branches. 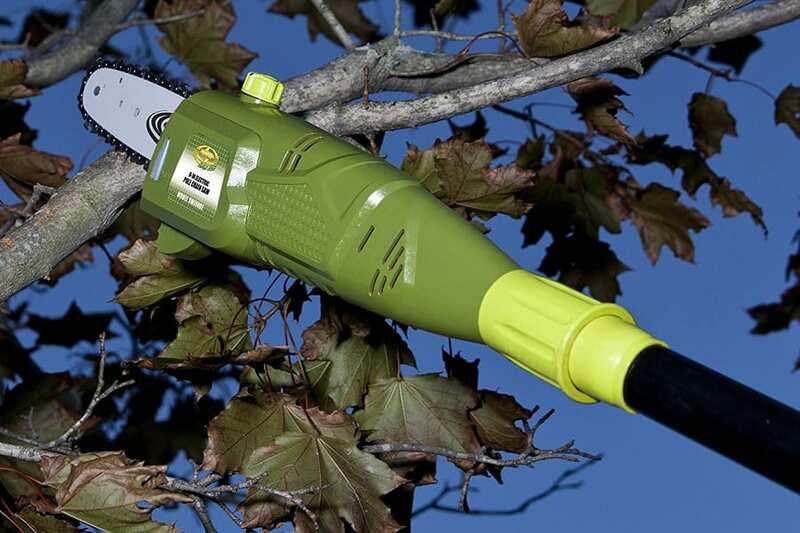 The battery capacity of the LPP120B is 20 volts, which gives it plenty of power to slice through a number of different branches within reach easily. Again, you’ll be a little surprised as to how well this saw works, even on thick branches when you’re fully extended. No drop off here. Another great aspect to the LPP120B is how much it weighs. At just over 6 pounds, the thing is not all that heavier than larger manual pole saws, even with a large battery on one end. So, you get the mobility of a cordless model, plus the low weight and reduced strain during longer uses. That’s a win-win. Part of the weight reduction of the LPP120B involves its minimal features, which is a matter of preference for some. If you’re someone that doesn’t mind oiling your chains from time to time, you’re in luck with the LPP120B, as it is a manual oil model, and lacks any auto-oil mechanism. On top of its exceptional performance, the LPP120B also comes with a full two-year warranty, so you can have the peace of mind that comes from knowing your tool is insured for 8 full seasons of use. The only real drawbacks with this saw is the usual lack of an adjustable saw bar angle, which seems to be something many manufacturers still don’t feel like prioritizing just yet. Still, it would help to have. There’s also the lack of a battery and charger obviously, but that’s easily fixable. Truth be told, good cordless pole saws can be a little tricky to track down, so I was very pleased with how the BLACK+DECKER LPP120B worked out. There wasn’t a power drop off at a full charge, and the light weight combined with a 10-foot extension max made this one of the easiest pole saws to use. If you’re dead set on a cordless model, make it this one. It’s no surprise that Sun Joe made this list twice, as their pole saws are among the best and most affordable you can find. They also like to include quite a few features in their power tools as well, usually addressing both safety and convenience. The Sun Joe SWJ803E-CMO Electric Pole Chain Saw is both functional and fashionable -- if you’re into camo that is. Even if not, oh well, you have a unique looking pole saw. Fortunately, the SWJ803E-CMO is not just about looks, as it hits all the right marks for what you want out of a corded electric pole saw. In fact, if you’re trying to choose between a gas or electric pole saw, and have an average sized yard or property that’s well within reach of the average extension cord, I strongly advise you consider this one first, as it’s just as powerful as many gas models, plus a few handy extras. Let’s start with the pole. The SWJ803E-CMO can extend to a maximum of 7.2 feet in a matter of seconds, which gives about 12.2 feet of maximum reach depending on your size. Not the longest you’ll see, but still long enough for most trimming needs that don’t require a professional. As for the saw bar, you get ten full inches of coverage, 2 inches more than most electric models. On top of that, the actual exposed part of the saw bar is 9.5 inches, which means you can slice through branches that are up to 9.5 inches thick themselves. Lower branches tend to be thicker, so that’s a significant advantage. The SWJ803E-CMO is also quite powerful, running off of 8 amps. 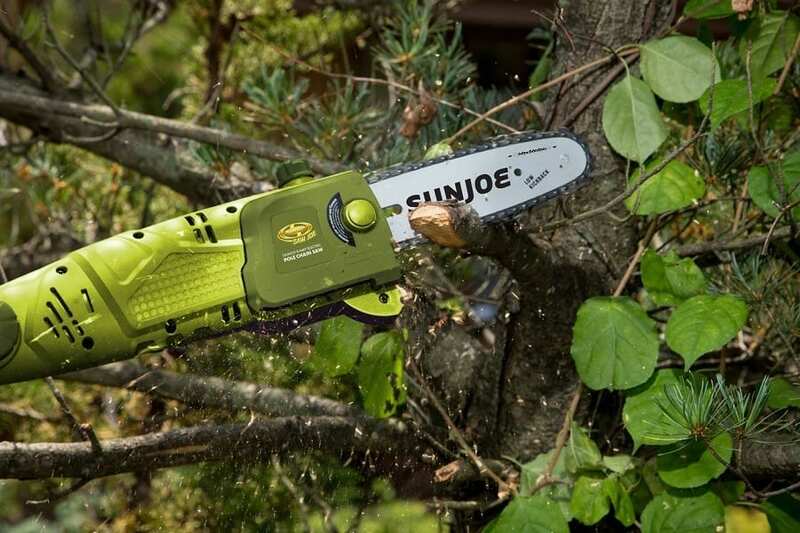 Again, this is more than most electric models are willing to offer, which leaves you with enough power to cut right through tough branches without having to make multiple passes or press down hard on your end. Now for one of my favorite parts. The SWJ803E-CMO has an adjustable saw bar angle, letting you move it anywhere from 0 to 30 degrees in just a few seconds, so you can customize the angle to your cutting situation, leading to a better, more safer cut. As for safety features, the SWJ803E-CMO has a hook to wrap your cord around in the back, so it doesn’t come unplugged with the slightest tension. There’s also a safety lock that prevents you from accidentally powering on the saw if you hit the trigger. That’s always a good thing. Hate oiling the chain on your own? You’re in luck there too. The SWJ803E-CMO comes with a very smart and efficient auto-oil mechanism that keeps your chain lubed anytime you’re using it, helping the chain work more efficiently, and protecting the life of the saw. The only real complaint with this excellent pole saw is the actual pole length. 7.2 feet is certainly not bad, but it’s definitely not the longest it could’ve been. Maybe Sun Joe will tack on an extra foot or two in future models. At the end of the day, the Sun Joe SWJ803E-CMO is one of the best electric corded pole saws you can find, and that’s especially true if you require an angled saw bar. The extended saw bar and high power make this model a leg up for sure, and you get all of this for well under $100. Highly recommended. Why Should You Buy Pole Saw? Pole saws aren’t often the first thing most people think of when purchasing power tools, and that’s understandable to an extent. Drills, circular saws, and maybe a nail gun are usually higher up people’s lists, which does make sense. However, if you have trees on your property, you need a way to maintain them, especially if you want to avoid hazards and keep the trees looking their best. There are a lot of ways to go about this, but pole saws are an ideal solution for many reasons. There’s no question that you can always call a professional landscaper or arborist when you need to have your tree limbs dealt with, and they will always do a great job, but the costs can add up quickly. Now, there are some instances where you need to call a professional, such as when you have multiple branches damaged, power lines nearby, or when the issues are way high up the tree. But I’d say about 80-90% of tree trimming and pruning can be done on your own. Most quality pole saws cost anywhere from $50 to $150, depending on the model and type. That’s typically less than the cost of having someone come out and do it for you. A one-time investment can save you hundreds and thousands of dollars in the future. Another great reason to get a pole saw is the convenience it offers. Even if you don’t mind calling a professional from time to time, when you have a pole saw on hand, you can go and take care of the issue yourself right that instant. This is particularly helpful when you have sudden issues with broken limbs, or simply need to trim your tree down to let some light through, or allow surrounding branches to flourish more. Or, you can be like my dad, and cut off the lowest branches from a tree in the backyard because I kept climbing the tree at much too young of an age and getting stuck all the time, even after being told to stop. 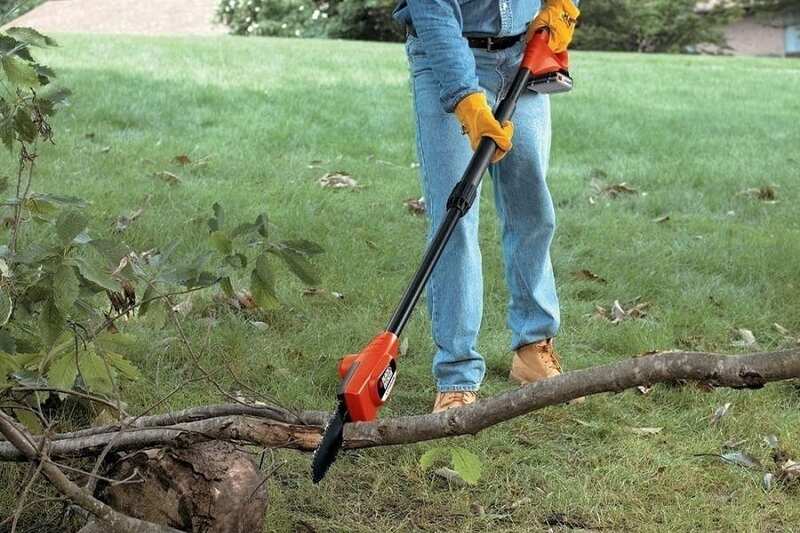 Regardless, having a pole saw on hand gives you instant convenience in always being ready to do some quick yard work on trees and even some other vegetation if needed. People have been sawing trees using different methods for years. The most primitive approaches included climbing up into the tree with a little hacksaw and then sawing off limbs by hand. It’s safe to say not everyone is willing to scale a tree to take down a branch. Others may have tried standing on a ladder or step stool and trying to reach a branch, which is obviously not the safest approach either. Let it be known that scaling a tree or trying to saw from a ladder is not safe. At all. 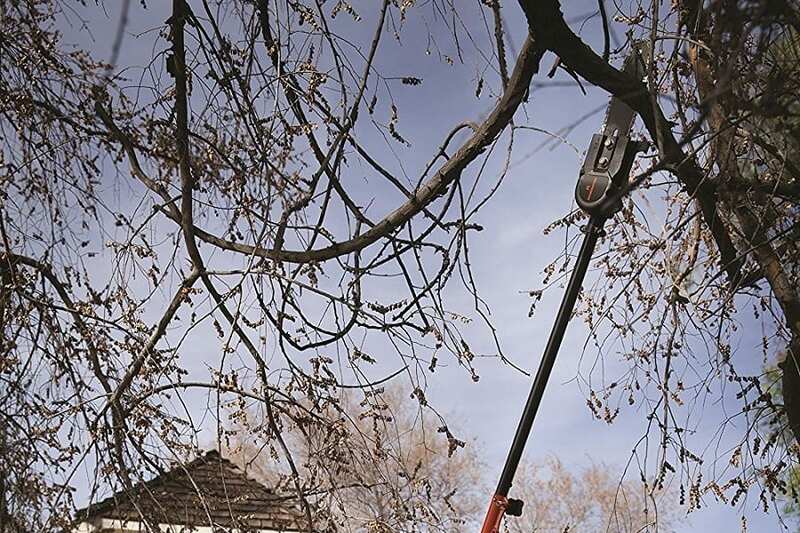 A pole saw lets you stay firmly planted on the ground while cutting branches, which is just about as safe as it gets. So, if you’re thinking about getting out that ladder and hand saw for a bothersome branch, save yourself the hospital bill and order a pole saw instead. Pole saws all have a similar build and function, but there are some core characteristics that you need to go over first before shopping. Doing so will prepare you to sort through the choices while ensuring that you get a product that meets all of your needs and expectations. This is always the great debate with a pole saw. Both power and manual versions have their strengths, but also a few limitations. Manual pole saws are the more traditional of the two and often come with both a saw blade for larger branches and clippers that can be used to snip off smaller branches a little over an inch thick. 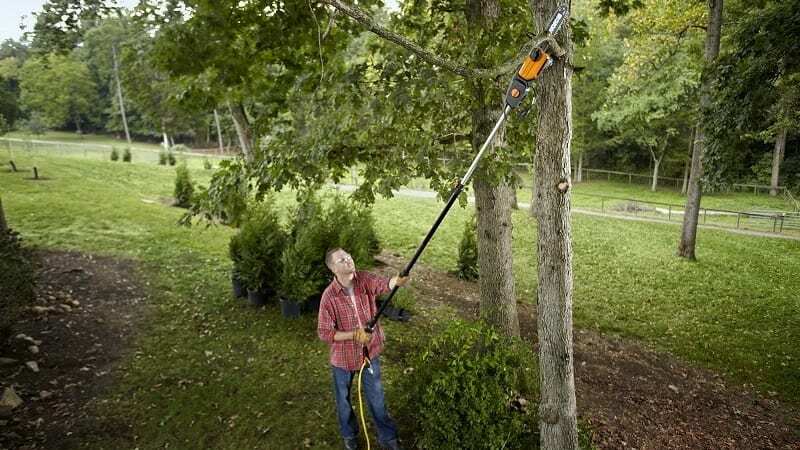 Manual pole saws are also usually the longer of the two as well, so you can reach branches several feet up the tree. Also, the design of the clippers and blades are generally gentler on the tree branches, which reduces the risk of infection and mold spores to get in the tree. The downside, of course, is the fact that you’ll be the one supplying the power to the saw, which not everyone is either able or willing to do. Powered pole saws not only use gas or electricity to saw a branch, but they also have an entirely different type of blade, which is a miniature chainsaw bar. These are appealing since you simply power the saw on, and bring the saw bar down onto the branch. These pole saws are more expensive, however, and also require varying degrees of maintenance. They are also not very apt at pruning trees, due to the chainsaw blade. So, if you are taking more of an amateur arborist approach, and don’t mind doing the sawing yourself, a manual model is the best choice. If you have more heavy-duty sawing needs and plan on doing more trimming than detailed pruning, a powered pole saw is best. As for me, I think it’s good to have both. Blade size is important regardless of the type of saw. If you’re using a manual pole saw, a longer blade lets you take on larger branches with more ease, while also providing more saw power efficiency with each pass of the blade. On a powered model, the exposed blade length is your maximum cutting capacity. So, if you have an 8 inch saw bar with 7 inches exposed, you can only saw branches 7 inches and under with one pass. Larger saw bars allow for larger branches to be cut easier. Try to find powered pole saws with at least 8 inches of total bar length. All of the above picks are at least 8 inches. Do you want to be able actually to reach the tree branches, right? That’s the point of the pole saw, after all. Pole length is something you’ll see the most variance in among pole saws. Extendable models usually have telescoping poles, so you can quickly adjust the length and then lock it back in place. You’ll often see pole saws that have a “maximum reach” listed, but this is not the pole’s maximum length. The maximum reach, or “reach up to” spec on a pole saw incorporates both the pole’s max length and the user’s height. Most manufacturers add 5 feet to the max pole length to get this total. Manual pole saws can range from 7 to 15 feet long, sometimes more. With powered models, make sure the pole is at least 7 feet long. Everyone loves having a few extra features to make things a little easier. At a minimum, you’ll want a pole saw with an extendable pole, clippers if it’s a manual version, and that’s pretty much it. Extra features can include things like automatic chain lube mechanisms, safety switches, ergonomic grips, adjustable saw bar angles, removable poles, and more. 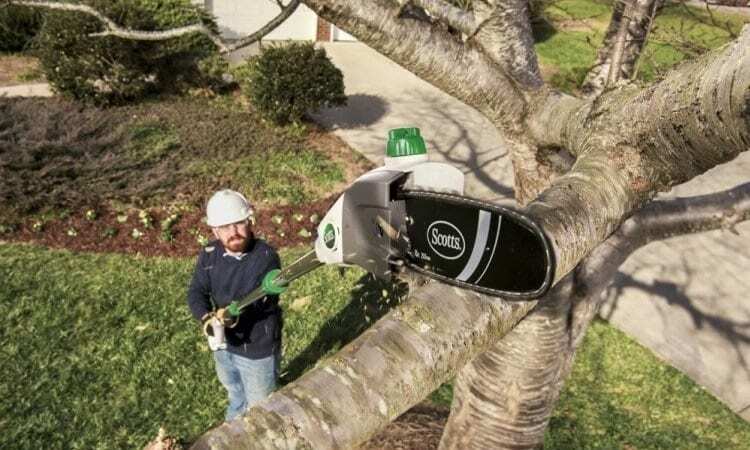 All of these offer specific advantages that can improve the accuracy, safety, and ease of your tree trimming and pruning. Alright then. Now you should have a much better idea as to what you’re looking for with a pole saw, and some excellent choices regardless of what type you think you might need. I highly recommend any of the above pole saws and would have no issue with having any one of them in my shed. Just remember to consider what your main needs are, how much you’re willing to spend, and if you can handle using the saw. Before you know it, you’ll have your property’s trees looking better than ever, and always prepared for whenever a branch or two needs to be taken care of. Good luck!